Google has released a new way for them to notify webmasters of possible penalties with their web sites. In the past, Google sent emails, but this was abused by German hackers a couple times, so Google had to change how they handled that. If you login to your account and do not see a message, it does not mean you do not have quality search issues, at least today. Google said, "the number of sites we’re contacting is small, but we hope to expand this program over time." So, over time, hopefully all verified sites with quality issues will show a message in the message center. Danny Sullivan explains that Google still may send out email notifications, but that will stop shortly. 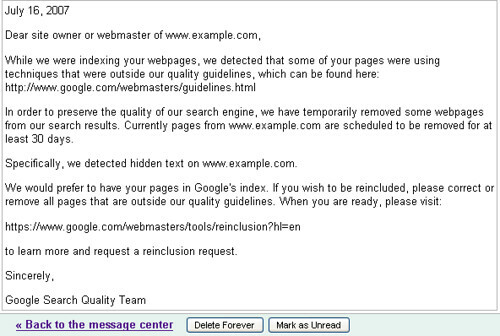 There is a current issue where if you get an email notification, and are not verified within Google Webmaster Central - you won't be able to see the message even after verifying your site. But Danny said they will be fixing that issue shortly. Forum discussion at DigitalPoint Forums and WebmasterWorld.